Carboxymethyl Cellulose (CMC) Market size was over USD 1.2 billion in 2016, with projected gains over 4% CAGR between 2017 and 2024. Positive outlook for the low-fat and ready-to-eat food is expected to propel the global carboxymethyl cellulose market (cellulose gum market). As stated by the WHO, in February 2018, obesity across the globe has nearly tripled since 1975. In 2016, over 1.9 billion adults (aged 18 years and older) were overweight; out of these, more than 650 million were obese. Prevalence of obesity and overweight issues among children and teenagers has also been a growing concern in most regions. Number of obese or overweight children and adolescents aged 5-19 surpassed 340 million in 2016. Carboxymethyl cellulose helps thicken & stabilize foods, replaces fat, thereby increasing fiber content in foods. Furthermore, manufacturers will demand for the product as an alternative to conventional additives in the coming years, to meet the escalating demand from consumers for gluten-free desserts. Oil & gas segment held substantial share in global cellulose gum market in 2016. Demand for drilling fluids is directly proportional to the number of oil and rig drilling activities. The dynamicity of oil & gas drilling activities globally is one of the key factors regulating the demand for the product for its use as viscosifiers in drilling muds. Carboxymethyl cellulose plays crucial role in digging, drilling and other activities associated with oil & gas. However, in the recent years, the oil sector witnessed a dramatic fall in oil prices, followed by a decreased rig activity. The subsequent repercussions have been sluggish carboxymethyl cellulose market demand particularly in the U.S. Rising threat of substitute might act as a major restraint for the cellulose gum market in the next few years. Few types of cellulose ethers, available with lower costs, possess properties similar to CMC and can replace the product in numerous applications. Possible carboxymethyl cellulose alternatives include: other hydrocolloids: xanthum, pectin, guar gum, carrageenan and microcrystalline cellulose, ethyl cellulose, microcrystalline cellulose, etc. Industry participants have been engaged in developing the product with the higher active matter content and hence, CMC with purity above 95% is likely to observe strong growth aspects by 2024. This purity range will rise with CAGR around 4% by 2024. 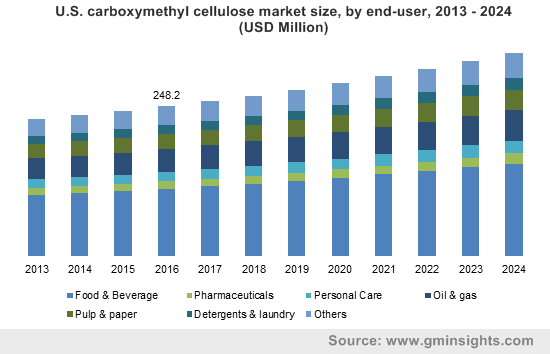 The carboxymethyl cellulose market end-users including food, pharmaceuticals and personal care will continue to have demand for high purity cellulose gum, thereby fueling above 95% purity versions by 2024. In pharmaceuticals and personal care products, carboxymethyl cellulose serves mainly as a thickener and binder. Modifications of food and personal care formulations will provide the new opportunities for the products with purity above 95% in the future. CMC with purity range 80%-95% is projected to witness growth with CAGR above 3% over the forecast timespan. The carboxymethyl cellulose market demand will be mainly propelled by detergents & laundry, oil & gas and construction sector applications. Food & beverage segment led the overall cellulose gum market in 2016 and is projected to exhibit fastest growth over CAGR 4% over the forecast timespan. The product applications in this area with robust demand include: frozen desserts, dairy products, bakery products, salad dressings, condiments, soups & sauces, processed meat, diet foods, white wines, etc. Pulp & paper industry has been one of the oldest end-user industries the product and accounted for 15% of the total demand in 2016. In papermaking, the film-forming characteristics of the product reduce the surface porosity of paper and create a tougher printing surface. CMC has been demanded for various applications in this area such as toweling, specialty papermaking and coated & uncoated paperboards. The product will witness significant demand for its use as an additive in wet-end and sizing agent for the surfaces; as a co-binder and rheology modifier in paper coating formulations. Asia Pacific led Carboxymethyl Cellulose (CMC) Market in 2016 with a massive share of approximately 40% and is projected to follow the similar trend over the forecast timespan. It is anticipated to be the fastest growing market with China and India. The massive demand share in Asia Pacific has been primarily contributed by the expanding food & beverages and personal care industries. Several foremost multinational ingredient companies, intending to move in the vicinity of fastest growing economies, marked substantial investments in Asia Pacific in last 3 years. For instance, in November 2017, Cargill announced its USD 240 million investment plan in India’s food processing industry. In May 2017, Symrise opened an innovation center in Singapore with the vision to strengthen its position in Asian food and nutrition industry. Such trends present brighter scope for carboxymethyl cellulose market market in the regional food & beverage sector by 2024. Global carboxymethyl cellulose market was fragmented in nature in 2016 Some of the prominent industry participants include: Akzo Nobel B.V., J.M. Huber Corporation, Triveni Chemicals, Ashland, Lamberti S.P.A, Dai-Ichi Kogyo Seiyaku Co. Ltd. etc. These companies have a strong foothold in the market with positive brand images thereby creating a major barrier for new entrants in the industry. 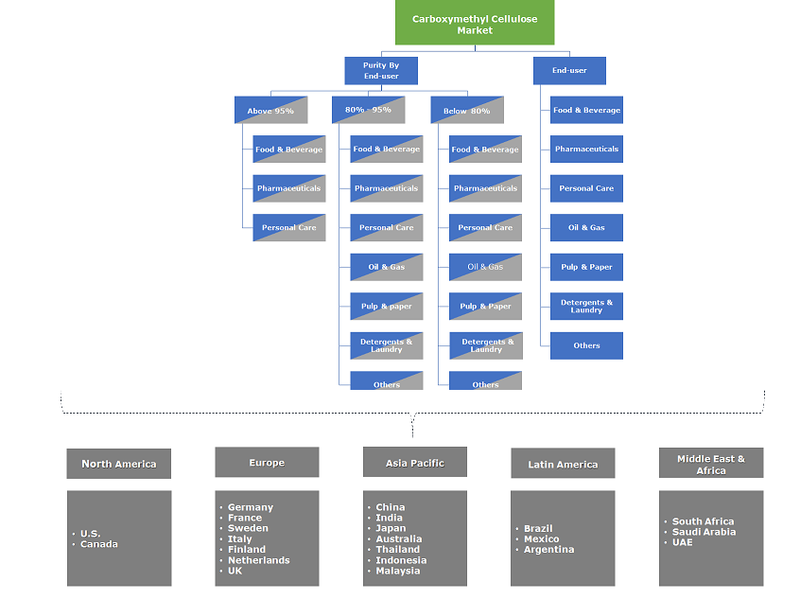 Manufacturers’ strategic initiatives involved significant capacity expansions to meet the expanding carboxymethyl cellulose market demand in the last decade. For instance, in December 2012, CP Kelco (subsidiary of Huber) announced purified CMC capacity expansion at its facility in Finland. Carboxymethyl cellulose is an anionic water-soluble polymer and exhibits exceptional absorption, thickening and water retention characteristics. The product performs various roles as: binder, thickener, stabilizer, suspending agent, protective colloid, flow control agent, gelling agent, etc. The product regulates viscosity without gelling and serve a range of end-users including: food & beverage, pharmaceuticals, personal care, oil & gas, pulp & paper, detergents & laundry, construction, paints & coatings, textiles, etc.